Do you know which music legend is opening this year’s Essence Festival? If you know the answer, you could win The Real fly away package to New Orleans, Louisiana for the 2017 ESSENCE Festival presented by Coca-Cola during the The Real Essence Festival Trip Contest. 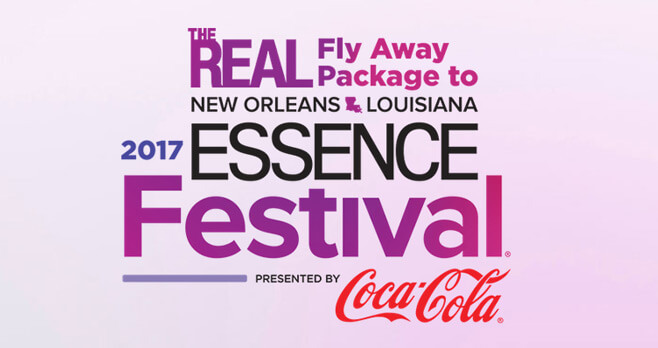 One lucky viewer will receive a trip for two to New Orleans, LA including airfare, hotel accommodations for 2 nights, and tickets for night concerts on June 30, 2017 through July 2, 2017 at the 2017 ESSENCE Festival presented by Coca Cola. Go to http://thereal.com/page/2017/05/22/win-a-trip-for-2-to-the-2017-essence-festival/ during the Entry Period. Register by completing the entry form as directed. Check a box acknowledging that you are at least 18 years of age. Check a box acknowledging that you have read and accepts the Contest’s Official Rules. Click “SUBMIT” to be entered into the Contest. Open to legal residents who are physically residing in one of the 50 United States (but excluding the territory of Puerto Rico) or the District of Columbia who are physically residing there. All entrants must be at least 18 years old (or the age of majority of their state/province of residence) as of the date of entry. Begins at 9 a.m. EST on Monday May 22, 2017 and ends at 11:59 p.m. EST on Friday, June 2, 2017. Limit one entry per person/e-mail address per day per Show episod during each day of the Entry Period. Sponsor will select 3 semi finalists from all eligible local market entries in a random drawing which will be conducted by Sponsor on or about Tuesday, June 6, 2017. For name of the Prize winner, go to the Web Site after Friday, June 9, 2017. Sponsored by AFN Productions, Inc. 3500 West Olive Avenue, 10th Floor Burbank, CA 91505. For complete details, including Official Rules, visit http://thereal.com/page/2017/05/22/win-a-trip-for-2-to-the-2017-essence-festival/.